A few months ago I bought a new Bluetooth headset to replace my trusty old Voyager Pro+. It was still working but people at the other end were complaining that my voice would cut out regularly even though I could hear them fine. Besides, my old headset didn’t want to work well with my Mac. That’s because Mac’s have a problem connecting Bluetooth headsets in general – so it wasn’t the headset’s fault. 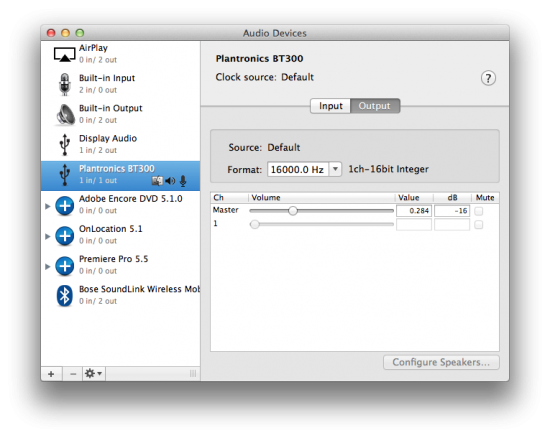 I wanted one that also works as an audio input device so I can record screencasts for many of my web hosting clients. After a bit of research I came across another Plantronics model, the Voyager Legend UC. 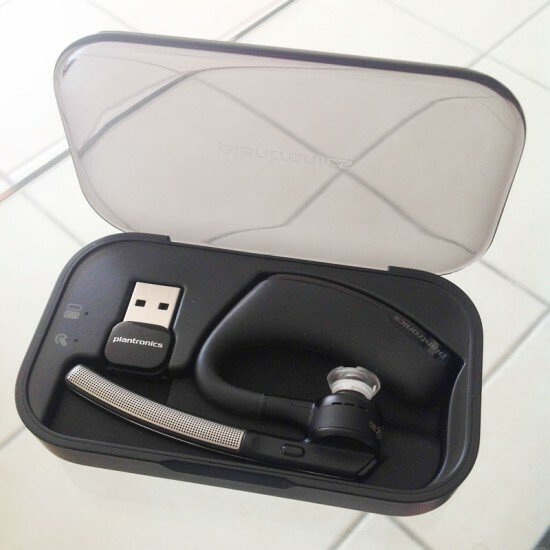 This particular version comes with a small USB dongle, so it can be used as a Bluetooth headset AND wireless USB headset. Since February this worked great with my iPhone and iPad, but I never got that elusive USB function to work. Until today when I had a technological breakthrough! The Problem: Voyager Legend sounds great on iOS, but rubbish on Mac. Why does it have to be this way? Here’s the thing: when I pair the Voyager Legend with my Mac it connects and technically works – but sounds awful. Think “analogue telephone from the sixties” effect. As an additional bonus, there’s so much digital interference in the audio that it’s not really usable. It’s good to keep in mind if you ever want to make anonymous phone calls though. I’m not quite sure why this interference thing happens, but I can tell you why the “phone effect” is applied: the microphone only transmits my voice at 8kHz when it’s connected via Bluetooth. Oucheroo indeed! When you make a Skype call on iOS it sounds much better – so we know this thing CAN perform better. Why this can’t be improved is a mystery. 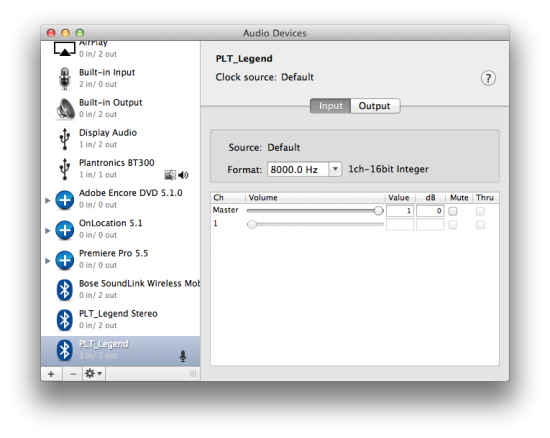 8 kHz for audio recording – is that really all BlueTooth has to offer in 2013? Surely not. 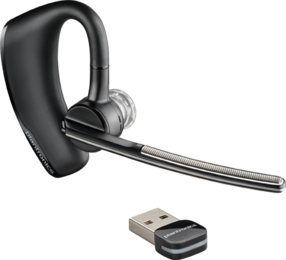 The guys at Plantronics were obviously aware of this and gave us something called the BT300, a small USB dongle that tells your Mac it’s a USB audio device, and really connects via “non-Mac Bluetooth” with the Voyager Legend. It’s genius! The same dongle has been working fine with previous Voyager models so the idea isn’t brand new. However, even though my headset was correctly pre-paired to the dongle, I still couldn’t hear or record any audio with it. This was despite the BT300 appearing as an input and output device. I even tested this on Windows 8 – same thing. 16 kHz is more like it. Now all we need to figure out is how to make it work. I should have thought about this. I’m not used to installing drivers anymore. I’ve come to expect things to “just work” . Something about the driver is even casually mentioned in the instructions. Perhaps I should have read those earlier. Besides, it’s just not really called a “driver” – it’s called something more flashy and suggests a ton of functions that I didn’t want – but general connectivity seems to be one of them. In fact the “driver” called an “app” called Spokes(TM) Software. Once installed, I was wondering where a “control panel” of sorts might be hiding. Turns out there isn’t one – Spokes must somehow be running the background. In fact, when I started Skype, Spokes was telling me that someone else is trying to communicate with my headset, and asked if I was OK with that. Nice touch! And voila – once installed I can now record audio using the BT300, and also use the Legend to listen to things. It works as a selectable audio input and output device and sounds so much better than before. Oh, and Skype calls work too of course. One more thing of note: I’m using a Thunderbolt Display with my MacBook Pro. The USB ports are located right next to the Thunderbolt port, and I’ve noticed that there’s some digital interference when I plug the BT300 into one of the MacBook USB ports. I guess the Thunderbolt cable may not be shielded as well as it could be. Using one of the USB ports on the back of the display works much better and without interference. Anything else? Would you recommend this thing? The Voyager Legend in its El Swanko charging cradle. Also fits the BT300 dongle. Charge the case and the headset when connected via Micro USB. The headset is charged from the case’s battery. Genius! The one thing that’s debatable is that it has a proprietary charging port. It works with a magnet rather than having to wear out contacts, so it’s an improvement. Many may argue that having to carry another cable may be inconvenient. In reality however this is hardly a problem, thanks to an included Micro USB to Platronics adapter. It’s tiny and fits into every pocket. Besides, the charging case HAS a standard Micro USB port, and it allows to charge the headset and the case battery in one swoop. I haven’t used the adaptor once for charging and always use the case. So forget that it’s an issue. Just get the model with the case. I have the second version and have no idea what the third version is. They seem to cost the same. The “standalone” version does not include the charging case or USB dongle. You can buy those separately at a later stage, but it’ll cost you more. Thank you so much for posting all the details here, especially providing the Mac link for Spoke in there. It didn’t come up on Google when I searched for it! Jay, I tried everything you post in here but if I want to listen something in my laptop only works when skype is on. Like youtube videos. Any suggestions for this? Hi Ron, that’s a weird one (but then, the Plantronics is a little weird when connected to anything other than a mobile device). I can use it on my MacBook only with the USB dongle. I’ve tried everything to connect it directly via Bluetooth but was unsuccessful. I have the same problem with my Microsoft Surface Pro running Windows 8.1: USB dongle works fine, but Bluetooth does not. So I always use the USB. A driver is needed for both Windows and Mac for the headset to be recognised, and mine seems to work without Skype – at least for listening. Recording does work, but the sound quality is so bad it’s not worth mentioning. In the driver, there’s an option to switch on “narrowband audio” – it’s meant to save battery life at the expense of sound quality. Switch it off and the headset will sound much better in your ear, although you won’t get 6-7 hours of listening time out of it (more like 3-4). Worth it though! thanks so much for this! I still am so confused as to the the difference is between the 235 and the 235m, I accidentally bought the M version (or third version) and im hoping it still will work the same. Hi Samantha, I was puzzled by that as well. I have the non-M version (the second one), and I imagine that the Lync compatible M version (the third one) packs all the punch of the second, with added goodness. Let me know if it works, and what hardware you’re using it with. I’ve been using the Legend for over two years now and it has never let me down for phone calls from my iPhone or iPad. I learned from amazon, the M means Microsoft Optimized. How do you use this headset? Do you use it for conference call through lync / Skype business? I have put this one inside washing machine now look like it is not working. Please advise on this how to fix that.